This is an exciting time for historic Kernersville Moravian Church which was established on South Main Street in 1867, when the town only had 150 residents! This past August, the church welcomed its new pastor, the Reverend John G. Rights to continue its rich history and lead it into the future. 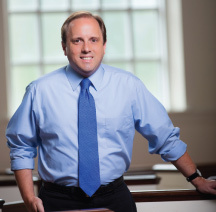 Prior to arriving in Kernersville, Reverend Rights served 11 years as an Associate Pastor at the New Philadelphia Moravian Church in Winston-Salem. Growing up in the Winston-Salem area, with friends in Kernersville, he was able to follow the growth of the church he currently leads. Not only does Reverend Rights come from a family of pastors, (he is the sixth member of his recent family to serve in the Moravian Church’s Southern Province, which extends from Virginia to Florida) his great-great-grandfather’s cousin, Christian Lewis Rights served as pastor of Kernersville Moravian Church from 1873 until 1891. Although the Moravian Church is widely recognized as the oldest Protestant denomination, many people are still not aware of its beliefs with rich and unique customs, history, and traditions. Each year, Kernersville Moravian Church celebrates several lovefeasts. This unique service stems from the early centuries of Christianity when believers would share table fellowship as a way of demonstrating their love for Christ and for one another. This type of communal meal is not a sacrament of the Church but an opportunity to experience through a shared meal the gift of God’s love. The lovefeast meal varies throughout the world; at most Southern Province churches, the meal consists of a Moravian bun and coffee. Participants sing hymns built around a scriptural theme during the serving and enjoy sacred choral music while partaking of the lovefeast. These services are usually celebrated on special feast days of the Christmas season or the week before Easter, and on special memorial days of the Moravian Church. Reverend Rights’ favorite is the Christmas Eve Lovefeast and Candle Service where during the concluding hymn congregants raise their candles remembering that Christ is the light of the world. It historically draws a large attendance and it is not unusual to see multigenerational families share this heartwarming and uplifting occasion. “Many non-Moravians consider themselves to be Moravian on Christmas Eve,” smiled Reverend Rights. 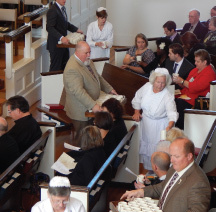 For many years, Kernersville Moravian Church has annually hosted a Candle Tea as a gift to the community and all are invited to attend. This year the Candle Tea will take place on December 5th and as always welcomes the Christmas season. Visitors tour the church to hear the singing of carols, view decorations and costumes, sample some traditional refreshments as well as learn some of the history of the church along with exhibits showcasing early and ongoing traditions. The highlight is seeing the beautifully decorated Putz which is a customary German themed village display of the nativity scene in the town of Bethlehem. Music and music education have always been important in the Moravian Church. Moravians have always used their music to express and communicate their faith and to enjoy each other’s company, and continue to do so today. The musical heritage of the Moravians is a living tradition. With an appreciation of the spiritual power of hymnody, ‘singing is believing’, it is perceived as nothing less than how humankind speaks to God. 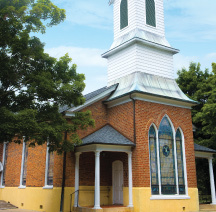 With this emphasis on music, it is not surprising to know that Kernersville Moravian Church is proud of its Chancel Choir, the Chapel Choir, the traditional Moravian Church Band, and the Handbell Choir which all perform on a regular basis. Both of the church’s worship areas also feature custom-built, hand-crafted pipe organs. Community outreach is a vital ministry and the congregation stays updated on the needs of those who live in their community in order to offer needed assistance where possible. In addition to supporting other local nonprofit service providers, the widely popular annual ‘Kernersville Christmas Stocking’ ministry has significantly helped to meet the needs of children and families throughout the years. The preschool program is continuing to grow as it serves the community offering programs for children between the ages of 2 years old to Pre-K. This program focuses on fostering a love for learning by using Montessori inspired methods that strive to appeal to the child’s intrinsic motivation to learn in natural joyful ways. With nearly 600 members, Kernersville Moravian Church offers programs for youth and adults of all ages, and welcomes visitors who are looking for a church family or would like to experience all that the church has to offer. Reverend Rights is enjoying his new life in Kernersville along with his wife Brandi, who is an elementary school teacher in Winston Salem, and their 2 year old son Matthew. The Pastor has been spending his time getting to know the church’s families and their needs while working to connect more with the community. He believes it is important to strengthen community ties and be actively involved, “This is our home,” Reverend Rights concluded. I have heard only great things you have done for family’s in the community, for the word says when one has done it for the least he has done it unto him. I always miss the chance to do for the grand children due to the funds and have to make excuses. They are 8yrs.Nashon and Nasriya 11,will be 12 in Nov. The food bank here in Kernersville says you help family’s but how do I get a application or sign up, for the Christmas Stocking”. If not u and the church family the I am asking God for instructions and direction so they can have something under the tree. Jesus is the true gift. And I teach this, but God blessed the children. Salvation Army tried the crowds and its not a personal from the heart giving. What can we expect upon our first visit? What is your protocol for worshipers and what are the demographics of your congregation? Will you be honoring the first Sunday with Communion? If so, are guests allowed to take communion with you? What time does your 11:00 a.m. service end. Please respond via e-mail. Thank you. The Ward-Barnes family. I was baptized by my grandfather at the Grace Moravian Church in Mt. Airy, NC. My uncle, Thor Johnson is buried in God’s Acre at Home Moravian Church and my mother graduated from Salem College, My mother served on the Moravian Music Foundation in Old Salem for many years. I am now a retired American/ Dutch professor retired myself now in the Netherlands and have visited Home Moravian Church in Herrenhut Germany with my mother and father before they passed. My thoughts now go back to my many visits to Kernersville while my grandfather and grandmother, Anna Reuss Johnson lived in ‘Blue Gables’ over on Salisbury Street.